Although I’m not a mad gardener I do find mucking about in the veggie patch extremely satisfying. Over the years I have watched my children enjoy eating cherry tomatoes straight from the bush, get really dirty digging for potatoes and poke amongst the leaves for zucchini. My family’s gardening experience confirms what Australian company Twigz already knows – that ‘plants grow kids’. Gardening has so many benefits for children. Apart from the basic joy of getting a bit of dirt under their fingernails, a garden requires patience, ongoing attention and provides children with the opportunity to learn about how things grow, the seasons and food webs. 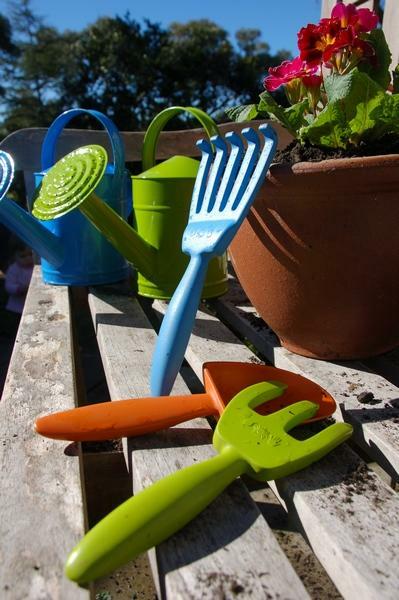 Noticing a lack of well designed, sturdy children’s gardening tools, horticulturist Chris Hajos began Twigz and set about providing young gardeners with the appropriate tools and resources to enjoy the garden. 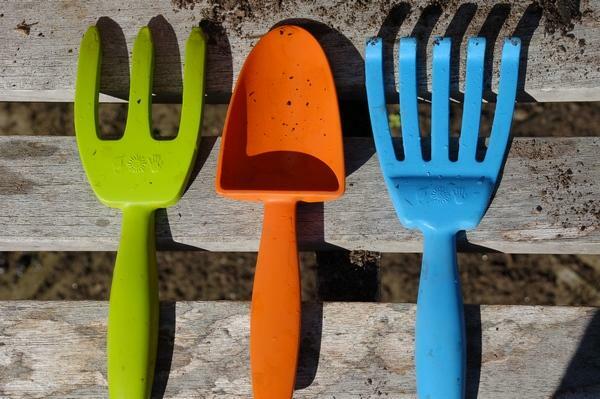 The Twigz gardening equipment is ergonomically designed for children and functions the same way adult tools work (but look much cooler than adult tools). Zinc coated steel in bright orange, blue or apple green and single piece plastic hand tools will facilitate many happy hours outdoors. The design of each piece includes thoughtful and important details – the buckets are short and squat so that they don’t tip over; the watering cans have two handles for easy, controlled lifting and the wheelbarrow is the first of its kind, featuring two wheels at the front so that it’s easy for children to manoeuvre. As well as the right tools, Twigz offers a host of gardening tips, online activities and a free gardening club for kids. Simple fact sheets including information on composting and how to set up a vegetable garden through to seasonal newsletters and recipes for home grown produce are all available and pitched at the perfect level for young gardeners. Twigz tools are available at a number of retail gardening centres and toy shops around Australia as well as online at Eco at Home. Small watering cans are $10, gardening gloves are $4.50, a set of three hand tools is $16.50 and large tools such as brooms and rakes are $20 each (or available as a set of four for $59).